LAST JULY I exposed a speech ostensibly composed entirely of Hitler quotes as being composed mostly, in fact, of fake Hitler quotes. The fake quotes from that novel spread very quickly. I have encountered them several times. It is from a slightly older novel, Pat Miller’s Willfully Ignorant from 2014. The propagation of a fake quote like this raises some questions. One could ask about the thought-processes of the person who decided to take a sentence from a novel and to misrepresent it as a quote from Adolf Hitler. Obviously such a person has no scruples. More important, however, is what it says about the people who readily embrace such a misrepresentation. 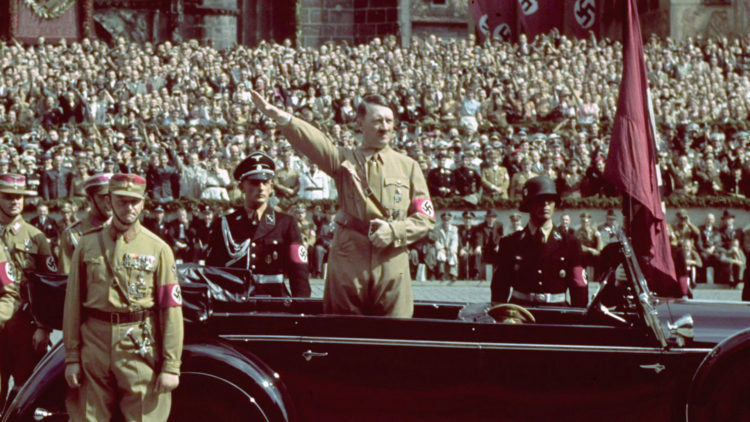 In the first place, it shows that, despite the obsession with Adolf Hitler in popular culture, much of the general public knows practically nothing about him. They never perused Mein Kampf to get a general idea of what Hitler said — which is rather the opposite of what is attributed to him here. The whole spirit of Mein Kampf is blunt and honest. Furthermore, it suggests that they are still under the influence of old war-propaganda alleging that Hitler presented in Mein Kampf theories about how to deceive the public. Anyone who investigates what Hitler wrote will find that he warned against the Big Lie as a tactic of the Jews. But the vast majority of people will never check, and the few who have checked either could not or would not obliterate that false belief. The belief that Hitler would have written such statements in a book for publication also shows an utter lack of critical thinking. The statement resembles something from The Protocols of the Learned Elders of Zion, which was alleged to be a secret document that ended up being published only because it was leaked. * There is no similar background story to explain how such admissions from Hitler could become public. We are supposed to believe that Hitler deliberately wrote down his evil intentions and had them published. People are just not thinking. * Incidentally, Protocols is clearly not an authentic document either, although, unlike this statement attributed to Hitler, it at least has some resemblance to the truth. Did Jews Provoke the Pittsburgh Synagogue Shooting? It is and has been a common occurrence for Hitler to be misquoted. I have seen this so many times over the last forty years that I expect it, not just in fiction, but also in so called documentaries. The History Channel is one of the worst offenders in this regard. When it comes to history and science, I never take anything seriously unless the information, especially if it’s statistics or a personal quote, is cited. Even then, I expect primary sources to be provided, not secondary or tertiary. People who are too lazy to cite their sources have no credibility and in most cases, have something to hide…like the truth. There is also a quote by Goebbles where he refers to telling a lie over and over again until it’s perceived as the truth that’s probably the most misrepresented quote in existence. 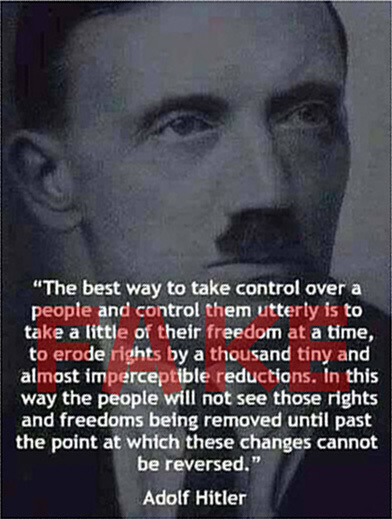 No one EVER prints that full quote wherein by saying such a thing, he’s referring to the jewish method of deception, not a practice of the Reich, but by printing the quote in a truncated form, the opposite appears true. Lastly, the Protocols of Zion are absolutely authentic. I guess the fact that virtually all of them have come to pass is just a cohencidence. When originally discovered, jewish authorities did NOT deny that they were indeed their global directives but merely called them “a forgery”. What is a forgery but an unauthorized copy of an ORIGINAL object. The jews were telling us to our faces that the Protocols are, in fact, a reality. More jewish wordplay. I agree with your statements about Hitler, Hadding, but not regarding the Protocols. In my opinion, the simple fact that practically EVERY PROTOCOL has been carried out – or is in the process of being carried out – is beyond coincidence and proof that there is something legitimate about this diabolical screed. Are you saying that Hitler didn’t say this sentence ? I think it is not clear in your writing above. Since I am translating some videos on Hitler into Korean, it will be appreciated if you teach me exact source. I thought Hitler said that sentence to alert German people about danger of the Jews. You know, that sentence is introduced at the beginning of the famous documentary “The Greatest Story Never Told” as told by Hitler. Protocols of the Learned Elders of Zion are 100% real and they are only the record of one meeting nearly 100 years ago. Merely a glimpse at how advanced the enemy of all other people actually is in their diabolical unwavering determination to rule the world. The people of the world sadly have earned the description of cattle they so enjoy calling everyone. The unconscious robotic masses auto piloting blindly through their lives. All politicians swear allegiance to Israel above their own countries all across the world. This is a fact. They are all masons and they swore this oath before they even were considered for office by the Learned Elders of Zion. Those few that do not submit are subject to endless wars that leave their countries smoldering ruins. in the ashes of these destroyed countries that resisted this tyranny a system of usury complete with a central bank under direct Jewish control is always the first new public work. It’s all right there for you to read in the protocols. Unfortunately that playbook is a century out of date and the current methods of deception, confusion, mind control and pure evil have made much progress in turning all of society into a total inversion where evil is good and lies are truth and the goyim fumble about like cattle to the slaughter blissfully unaware of the situation they are in. Anyone who has made it past all the shill sentries that stand guard to control all opposition and sow confusion are certainly aware of this truth about the world we live in but one defining fact remains. The immediate solution to the problem is never given. Always just the problem. Because the goyim simply are incapable of even fathoming how to fight a chameleon enemy that subverts their societies with such ease that the amoral goyim flock to the enemy and submit to their will to gain their favor and wealth. The only known instance of resistance in the last 100 years that had perhaps a decade of success before it was crushed by the entire mind controlled world was done by Germany but it almost seems that this resistance was allowed to happen simply as a way to genocide over a hundred million goyim by their own hands. The blind thrall cattle killed the freedom fighting goyim and believed it was “The good war!” because they were told they were fighting for freedom by the very masters of manipulation who now destroy their descendants. The world is owned by evil and it has been that way for all of recorded history. I wish I had an answer on how to stop it but I am just another weak minded fool in a sea of cattle being corralled with the rest complaining bitterly to the end as I watch the slow death of my race and weep for my children. It is a bit of an understatement to find only a few lines of fake quotes from Hitler when there are volumes of lies spewed endlessly about him and his accomplishments and failures. It seems the best we can hope for currently is clarifying a few false quotes from shill authors paid by the enemy. The Greatest Story Never Told has a number of falsehoods in it. The claims made in clips from professional documentaries (which constitute most of it) are reliable. The claims made in text, or in sound-clips from podcasts, are sometimes accurate, sometimes not. In particular I recall that there was a story about a German POW who walked home to Germany from a GULAG; this story was exposed as a hoax long ago. If Dennis Wise put a quote from a novel at the beginning of his video then he made a big mistake, but it’s not the only mistake. If you’re shocked to find out that the quote is fake then you’re a little naive. Fake Hitler quotes abound. On the Protocols. The fact that the content correlates to reality doesn’t say anything about who wrote it. There were observers of Jewish behavior and books about Jews for decades before the Protocols appeared. All that anyone has to do is to compile some observations about the nefarious behavior of Jews and portray a deliberate conspiracy to do those things, and voilà: Protocols. You can read Protocols if you want, but it’s not a document. It doesn’t prove anything. It’s just somebody’s observations and speculations. Essentially it’s historical fiction.